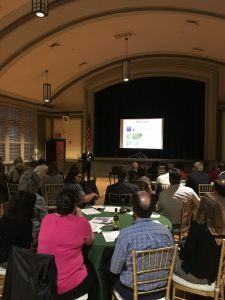 Sponsors reach the diverse membership of APAPASE which includes citizen planners, planning officials, and professions planners from the public, private and nonprofit sectors. It also supports programming for emerging professionals and students. We host a variety of events, ranging from educational to social. Our Annual Event is the headline event for planners in the Philadelphia region. Each fall, the membership meets at this educational and networking event. AICP certified planners receive CM credits for the educational portion. Student are on hand to receive the annual John E. Pickett Awards. 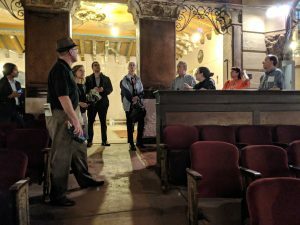 All members then have a chance to network and enjoy refreshments at a unique venue in the region. Most sponsorship levels receive tickets to the event. The APA PA SE Annual Event brings together planners from around the region. Annual Event Sponsors now have the exclusive opportunity to sponsor the event. Annual event sponsors are able to have their name exclusively highlighted in event marketing. They are also able to introduce the keynote speaker of the event and address the assembled membership. This is in addition to all the other sponsorship benefits. Platinum Sponsors and Gold level and greater sponsors also have the option to submit select project highlights and received featured job postings to our members. All sponsors are featured on this website, which receives over 44,000 website hits and an average of over 4,000 unique visitors each month! Articles are emailed to over 1,400 planners and colleagues every month. Our popular Job Postings section of the website has become a go-to tool for finding planning jobs in Greater Philadelphia and sponsors receive featured postings as articles on the website for greater visibility. 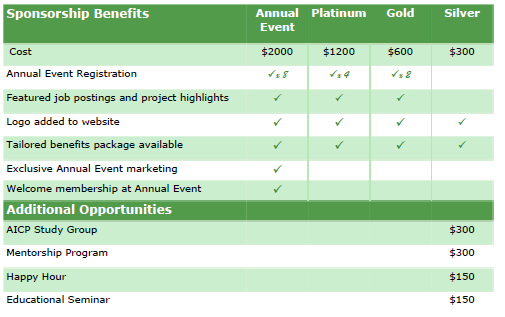 There are also opportunities to sponsor specific events that meet your organization’s outreach goals. AICP study group sponsors reach professionals who are reaching the next level of the profession while assisting them by providing study materials and refreshments for sessions. Mentorship program sponsors reach graduate planning students in the region who are looking to learn more about the professional experience they will have after graduation. We are reimagining the program for the 2019 year! Happy Hour sponsors reach a range of professionals and students at a local networking event. Educational Seminar sponsors reach AICP certified professionals looking to learn about a particular topic. Sponsors can help shape the agenda for the topic if they wish or sign on to sponsor an event already being planned.